The Marian Goodman Gallery is delighted to present our first exhibition with Tacita Dean. 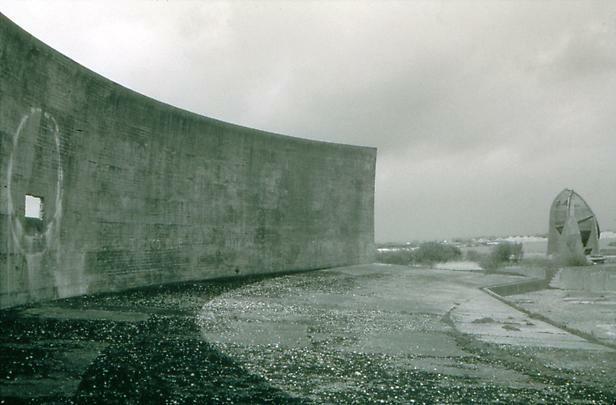 Two new films by Dean, Banewl (1999) and Sound Mirrors (1999) will open to the public on February 22, 2000. The exhibition will be on view through March 25, 2000. Gallery hours are Monday through Saturday, from 10 am to 6 pm. Tacita Dean will be exhibiting Banewl (1999), a 16mm film of last year's total eclipse of the sun in Cornwall, England. The film, set in the beautiful, bucolic landscape of Banewl, a farm near St. Buryan, Penzance, and shot in real time, records the total eclipse of the sun on August 11, 1999. Using four cameras, the film slowly moves through the event from the overcast morning to the appearance of the partially eclipsed sun later in the day. Originally envisaged as 2 _-hour film that would document the entire eclipse, Banewl became a shorter film about the effect of the eclipse on a small Cornish dairy farm in England. The work is 63 minutes long, shot in anamorphic film, and takes place entirely within the time frame of the eclipse. It will be projected in the North Gallery Viewing Room daily at 11 am, 2 pm and 4 pm. Sound Mirrors (1999), a 16mm 7-minute black and white film with optical sound will be exhibited in the North Gallery. Sound Mirrors was filmed near the village of Dunge on the edge of the Romney Marsh in Kent, England. The film's subject is three massive concrete structures built during the 1920s and 1930s as air-raid early warning devices. These "sound mirrors" were designed to reflect the sound of the enemy aircraft taking off on the other side of the English Channel, but due to the invention of radar a few years later became totally obsolete. Tacita Dean's film records these monoliths, which are now crumbling into the Romney Marsh. A number of prints from Dean's new book project, which include found photographs from flea markets in the United States and Europe, will also be exhibited at the Gallery. These works are part of a large body of work that will be published as a book in 2000. Tacita Dean was born in Canterbury, England, and lives and works in London. Her work has been exhibited internationally at the Witte de With, Rotterdam; the Tate Gallery, London; Lenbachhaus, Munich; the Institute of Contemporary Art, Philadelphia; and The Drawing Center, New York. Dean's work will be featured in major solo exhibitions in 2000 and 2001 at the Art Gallery of York University, Toronto; the Museu d'Art Contemporani de Barcelona, Barcelona; the Tate Britain, London; and the Museum für Gegenwartskunst, Basel (travelling to the Fonds Régional d'Art Contemporains Reins, Champagne; and the Museum Abteiberg, Monchengladbach). Her 16mm films include The Martyrdom of St. Agatha (1994), Girl Stowaway (1994), How to Put a Boat in a Bottle (1995), A Bag of Air (1995), Disappearance at Sea (1996), Gellért (1998), and Bubble House (1999).